Shown with our 6-1/2" Beeswax Molded Candle, sold separately. An Exemplary example of the metalsmith's art using time honored tools and techniques, this beautiful wall sconce is hand made from brass sheets with a candle socket of cast brass for a standard 7/8" candle. 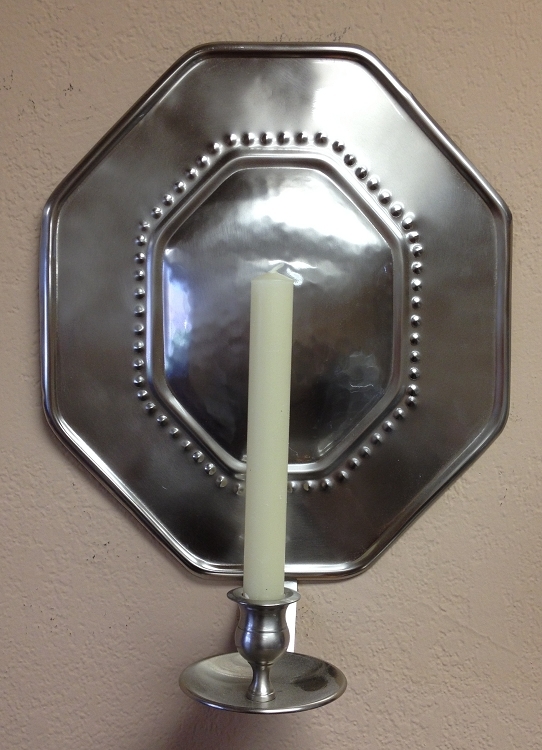 The entire sconce is finished with a heavy pewter plating. The center of the sconce is convex and hand hammered to reflect the soft light to all corners of the room. The one arm sconce is solid brass with pewter plating, and measures 14" high and 11" wide. The pewter finish is lacquered for easy maintenance. At its farthest distance, this sconce sits 4-7/8" from the wall. Weight: 1 pound 12 ounces. Please note that at this time hanging hardware is not included with the sconces. This sconce is generally hung with a nail through a hidden opening on the back of the sconce.